These three sheep really get around. I've got so many games in my Steam library that it's sometimes hard to tell where exactly I got them from; did I get this game off a Humble Bundle? Did I receive it as a gift for my birthday or X-mas? Or did I have a spare key thrown over to me by Mix-Master? In this case, I believe it's the latter so thank you once again to my benevolent benefactor :). So why exactly did I want this game? Mainly because my daughter is a fan of the kids TV show "Shaun the Sheep" so I fell into the same trap as I did with Ice Age: Continental Drift: Arctic Games but the only difference here is that I'm not feeling any regret for investing time in this game. Home Sheep Home 2 is a puzzle platformer with physics based puzzles galore: in fact the game has over 60 levels for you to try and each one of them involves the use of three characters from the TV show (Shaun, Timmy and Shirley) all with different strengths and weaknesses. 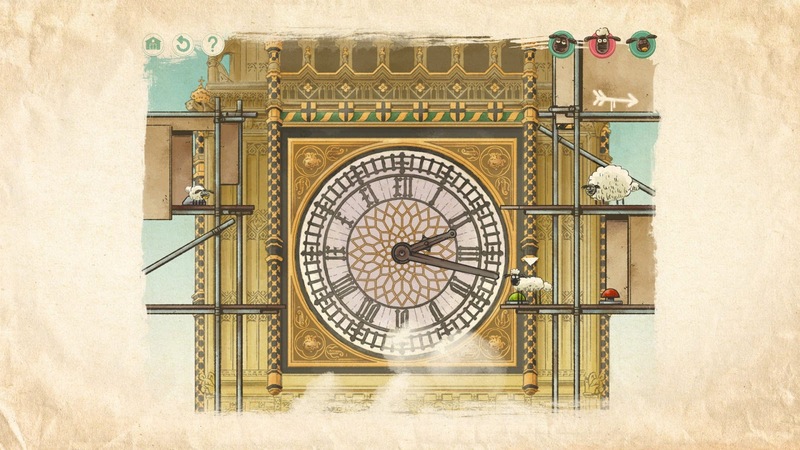 The game is based on the kids TV show Shaun the Sheep which is actually a spin-off from the series Wallace & Gromit. The game brings along its trademark humour and features three characters from the show: Shaun, Timmy and Shirley. The game has over 60 levels which should keep you occupied for at least a couple of hours (and much more if you're trying your best to get a high score). Best of all, each of the levels have their own theme/location. Sometimes Shaun could be visiting Australia, other times Big Ben and sometimes even outer space! There's not too much music in the game but what is used is good and you'll often hear the Shaun the Sheep theme playing at some point or another. "PUN-DEMONIUM: More sheep related puns that you can shake a lamb’s tail at." You'll be required to use teamwork in order to complete these levels as each character you are given control of (i.e. Shaun, Timmy and Shirley) have different strengths and weaknesses (not to mention the objective is to get all sheep to the end): Shaun is the middle-of-the-road sheep but he also happens to be the best jumper out of the group, while Timmy on the other hand, is tiny which means he can get to places the other two can't in order to activate switches and the like. Shirley is just huge which means she's good at knocking heavy items over plus she sinks when she enters water; this can be useful sometimes if you want to activate switches underwater that the other two would just swim over. So the game is a bit like The Cave to a degree, except it doesn't have Ron Gilbert's humour. It only takes about 3 hours to complete most of the levels (some bonus levels are only unlocked when certain conditions are met). However, I suspect it would take much longer if you like to challenge yourself in attaining a high score. Despite the original TV show being aimed towards 4-8 year olds, the game is probably better suited for 8-12 year olds as the challenges can be pretty difficult especially if you're not even sure how to use a keyboard yet to control your characters, let alone getting the timing right when performing jumps! While the game might be a bit too challenging for the target audience (4-8 year olds) and the game can be completed quickly (if you're not bothered about high scores), I still think this is a great physics puzzle platformer in its own right. It's probably one of the better games I've played based on a TV series too. Recommended, especially if you enjoy Shaun the Sheep. Is the game worth $9.99 USD? : Yes. There are plenty of levels to play here and for those wanting an extra challenge, you can always go back to beat your high scores. Bonus points if you’re a fan of Shaun the Sheep.